Building the future of our world. Developing new materials and modifying materials after or during their manufacture. Studying the manner in which atoms are arranged using a wide variety of instrumentation. How materials behave or interact with the environment such as how they conduct heat. 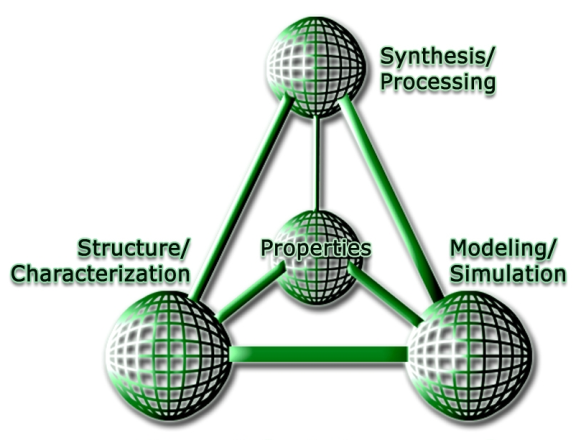 Using mathematical and computational tools to study and predict structure, properties, and processing. Studying the fundamental mechanisms of friction, wear, and lubrication of sliding and rolling interfaces by electron microscopy, vibrational spectroscopy and atom probe tomography techniques to improve reliability and lifetimes of aircraft engines and micromechanical devices. Conducting research in renewable power generation, and efficient buildings to develop energy and technology strategies that address the region and nation’s conservation needs. Processing: friction stir welding, ultra-fine grain, high temp mechanical behavior. Using multi-scale computational methods to model the deformation, fracture, defect evolution, and phase transformations in materials to develop more failure resistant materials. Characterization, development, and processing of a wide range of metal systems (nickel-based, lightweight, shape memory, and amorphous) for use in structural applications such as aerospace, defense, microelectronics and biomedical fields. Combining integrated computational materials engineering (ICME) with advanced processing and characterization approaches to develop novel structural alloys. Atomic to millimeter scale engineering of surfaces that are critical in nanoelectronics, ultra-high temperature coatings for aircraft structures and engine components, novel coatings and surface modification methods for biological implants, and atomically precise manufacturing.